Yep, I have witnessed an avalanche of cows. Well, technically, I’m not sure you can call it avalanche, but at least the cold temperatures are applicable. One of my favorite restaurants in San Diego is Souplantation. What’s not to like about a place with an all-you-can-eat giant salad bar, soup bar, pasta bar, fruit bar and muffin bar? And a few other yummy things. Souplantation used to hide the kid’s milk in small fridges next to the registers at the end of the salad bar line when you walk in. They’ve apparently rearranged their line and now you can just help yourself to the kids’ drinks, including the milk. And look how many bottles of milk they have, featuring one cow on each bottle! 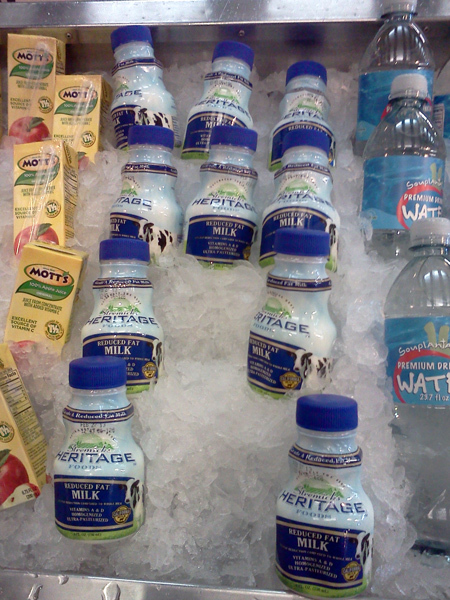 See the bottles of Heritage milk stacked up on top of each other, sitting on ice? Doesn’t this look like an avalanche waiting to happen? Don’t blink, you might miss it! By the way, if you previously missed it, it’s worth taking a closer look at the Heritage milk cow. It’s pretty disturbing, as in “mutant” like. Previous Post Did you know Yahoo has its own purple cow? Next Post Guess what? The cows are back! A muffin bar? That is a new one on me. Oh, you don’t have Souplantation where you are? It’s also called Sweet Tomatoes. I thought they were everywhere in California. Nope . . . we don’t have one here. I wish we did. Sounds like my kind of place. There are several locations in the Bay Area. Aren’t you up there somewhere? I’m in Sacramento. I checked the link you gave me and there are several in the Bay Area. I’ll have to go there next time I visit my parents. Try it out and let me know what you think. It’s definitely not fancy but all fresh, yummy food. It’s very popular here in San Diego and people who try it here beg them to come to their area all the time. I’m surprised I haven’t heard of it. Their headquarters are right here in San Diego and they’ve been around for over 30 years. They’re super slow to expand though, very conservative.